Steven Roy Howe (March 10, 1958 – April 28, 2006) was an American professional baseball relief pitcher. He played 12 seasons in Major League Baseball (MLB) for the Los Angeles Dodgers, Minnesota Twins, Texas Rangers and New York Yankees. A hard-throwing left-hander, Howe was the Rookie of the Year in 1980, saved the clinching game of the 1981 World Series, and was an All-Star in 1982. However, his career was derailed by problems with drug and alcohol abuse. He was suspended a number of times by Major League Baseball for drug-policy violations, but several times returned to show flashes of his former brilliance. Born in Pontiac, Michigan, Howe was a two-time All-Big Ten selection at the University of Michigan. He made his Major League debut at the age of 22 in 1980 and would eventually become the National League Rookie of the Year that year, the second in a string of four Dodger rookies of the year (Rick Sutcliffe, Fernando Valenzuela, and Steve Sax were the others). He saved 17 games during his ROY season, establishing a new rookie record. The following year, Howe helped the Dodgers win the World Series against the New York Yankees. Howe's career was plagued by alcohol and cocaine abuse; he first checked himself into a substance abuse clinic in 1983, but a relapse resulted in him being suspended for the entire 1984 season. Over the course of his 17-year career, Howe would be suspended seven times. After briefly pitching for the Minnesota Twins and Texas Rangers and being out of the major leagues for four years, Howe signed with the Yankees, where he once again pitched effectively. However, in 1992, Howe became the second player to be banned from baseball for life because of substance abuse (the first was Ferguson Jenkins, who was also reinstated). He successfully appealed the ban and re-signed with the Yankees, where he had one final great season in 1994, recording 15 saves and a 1.80 earned run average as the Yankees' closer. He failed to repeat the performance the following year and was relegated to a setup role, and was released in June 1996 after posting an 0–1 record with a 6.35 ERA. Howe finished his career in 1997 playing with the Sioux Falls Canaries of the independent Northern League. For his career, Howe posted a record of 47 wins, 41 losses, 91 saves, and a 3.03 ERA in 497 games. Howe published a 1989 autobiography, Between the Lines: One Athlete's Struggle to Escape the Nightmare of Addiction, which described his chemical dependency and hope for recovery based upon his newfound commitment to evangelical Christianity. The memoir was co-written with Jim Greenfield. 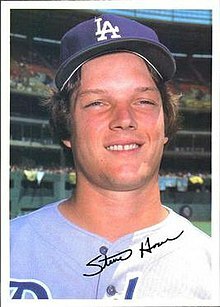 Following his retirement from baseball, Howe worked in Lake Havasu City, Arizona as a self-employed framing contractor. His company's name was All Star Framing. On April 28, 2006, Howe's pickup truck rolled over in Coachella, California, and he was killed. The toxicology reports following his autopsy indicated he had methamphetamine in his system. ^ "Autopsy: Howe had meth in system at time of crash - MLB - ESPN". Sports.espn.go.com. 2006-06-28. Retrieved 2011-11-09. Steve Howe with Jim Greenfield. Between the Lines: One Athlete's Struggle to Escape the Nightmare of Addiction. Grand Rapids, MI: Masters Press, 1989. This page was last edited on 24 March 2019, at 08:20 (UTC).